Have a personal encounter with the aquarium’s laziest tenants: Xena and Chico, the Linnaeus’s two-toed sloths in the Caribbean Journey’s jungle. The sloths venture out of their busy 15-hour sleeping schedule to interact with curious guests. 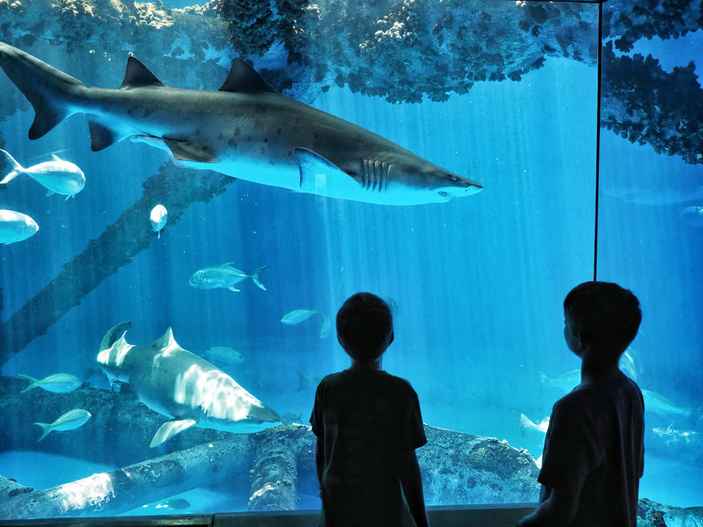 The meet-and-greet is part of the aquarium’s new Exclusive Encounters program during which guests can get up close and personal with animals and learn about their favorite foods and activities. Right now, guests can have an Exclusive Encounters experience with the two sloths and a flock of flamingos or go behind the scenes to feed the fish in the aquatic exhibits. Reserve your exclusive encounter online. A new media exhibition showcases the aquarium’s award-winning rescue program. The Wildlife Rescue Center gives a second chance to ill and injured shorebirds, raptors, marine mammals, and sea turtles. The exhibit follows 17 different animals on their journeys with the Wildlife Rescue team from when they were taken in, through their treatment and rehabilitation, and all the way to their release or re-homing. Viewings of “To the Rescue” is included with admission and runs during regular hours through February 2019. Hop, swim, climb, or fly into an immersive, hands-on journey through a day in the life of the aquarium’s residents. Explore the habitats and adaptations of weird and wild mammals, including bats, sloths, otters, and dolphins. Intrigued? Get a taste: Read about the time we went behind the scenes with the dolphins. Participants will become Certified Texas State Aquarium Junior Mammalogists! Register online. The Texas State Aquarium is located at 2710 N. Shoreline Blvd. in Corpus Christi. For more information, visit texasstateaquarium.org or call (361) 881-1200.